Just recently the cold winds came blowing in from the Northwest, signifying the return of Cleveland’s proud demon child Chimaira. Their forth studio album Resurrection delivers dark heavy blows one after another, rapid fire. It pulsates. Chimaira manages to combine all forms of metal, melted down in a pot, and severed with a side of balls. In all seriousness though, the album truly is a masterpiece. From beginning to end, the album pack punch after punch of ferocious metal. It’s intense and to a degree eerie. Incorporating creepy electronic undertones to the sound, something they’ve always done anyway, takes the music to a whole other level without it getting cheesy. Not to mention the artwork from the album looks sweet as hell. 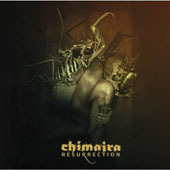 To put it simple: Chimaira lives up to their word when promising fans a heavy hitting album and Resurrection shows.